Xiaomi recently unveiled the Mi TV 4 in India and with a price tag of just Rs. 39,999, the TV is bound to sell like hot cakes. However, for some odd reason, dubious ‘Certified Buyer’ reviews were spotted on the TV’s Flipkart product page. UPDATE 2: Xiaomi has told Beebom in an official statement that the reviews are part of Flipkart’s initiative to promote new products. The company categorically denied that these were paid reviews, and had informed Flipkart’s team about the misleading reviews. Since then Flipkart has added a disclaimer as mentioned above. Even before the TV went on sale, its product page on Flipkart has three 5-star reviews from “Certified Buyers”. 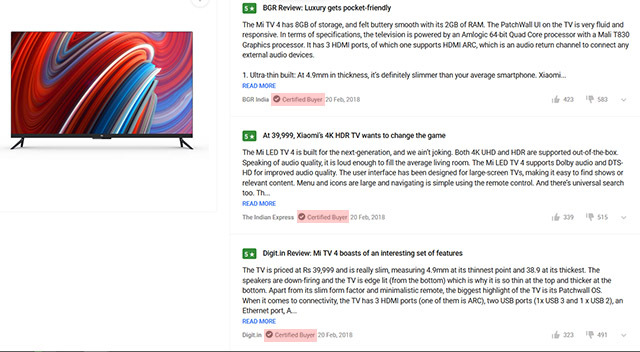 The ‘Certified Buyers’ in question are Indian publications BGR India, The Indian Express, and Digit.in, which posted reviews of the TV on their websites as part of the TV’s launch campaign. As expected, the reviews sing praises of the Mi TV and don’t care to list any of its cons. Quite misleading, I must say. While I wouldn’t deny that the Mi TV is a great product, I’m having a hard time believing Xiaomi would resort to such questionable reviews. But I also didn’t expect Flipkart to allow such reviews to be posted on its website as they are against the website’s policy. According to Flipkart’s product review creation guidelines, any reviews “by or on behalf of a person or company with a financial interest in the product or a competitor’s product (reviews by authors, artists, publishers, manufacturers without disclosure)” are not allowed on the platform. I would’ve been fine if the reviews had a fair disclosure, but none of the three reviews mention anything along those lines. The only thing for sure is that the reviews are definitely misleading, especially as the TV has not even gone on sale. My thoughts resonate with a number of buyers of Flipkart, as all three reviews have been heavily downvoted. We are trying to reach Xiaomi and Flipkart for a comment on the matter and will update the post as soon as we hear anything from the companies. Until then, we request you to voice your concerns to both companies on social media with the hashtag #CertifiedBuyers. Note: Portions of this article were edited to remove any speculation that has been clarified by Xiaomi’s official statement.